Recently, Hyundai Australia decided to have a little bit of fun and chopped the roof off of a Santa Fe to create a one-off seven-seat version of its midsize crossover. The car started life as a prototype for testing and tuning the suspension and was registered only for engineering use. That means it’s eventually destined for the crusher. Hyundai Australia says it originally cut the roof off to for photography purposes; in this case, to get a panning shot with all three rows occupied. After chopping the roof, interior trim was added to clean up the look. That probably would have been the last of it if someone on the marketing team hadn’t approached CarAdvice about a test drive on a closed course. Like the car itself, the resulting “review” wasn’t meant to be taken seriously. It pokes fun at the fact that the Santa Fe Cabriolet isn’t an all-weather car, and that you can’t take to a car wash or ski resort. Why? The car doesn’t even have a roof, which also means you can’t drive it anywhere with a chance of lightning strikes. Thankfully, we’re not in any danger of seeing a production Santa Fe Cabriolet. 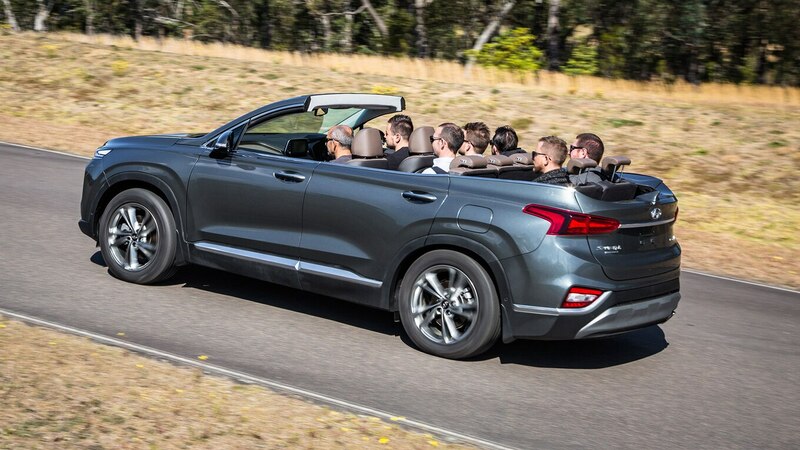 Hyundai Australia insists it has no plans for a seven-seat drop top and claims all of the extra components would make the Santa Fe heavier, larger and way too expensive. Then again, the Nissan Murano CrossCabriolet actually made it to production, so you never know. Check out the video below to watch the mock review.